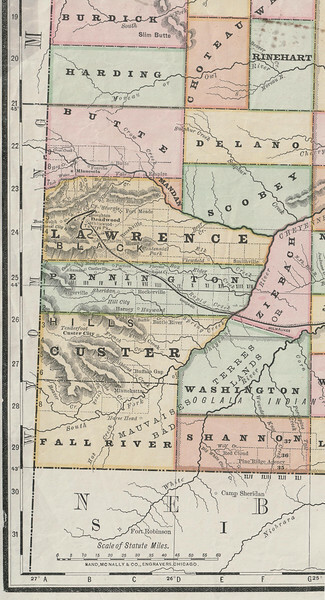 1884 MAP OF SOUTHWESTERN DAKOTA TERRITORY Lawrence County was a pretty good sized piece of real estate before statehood. This 1884 image is from the Andreas Historical Atlas of Dakota. This was before formation of Meade County to the east. Also note the absence of Harding County -- and the inclusion of earlier counties like Delano, Scobey, and Washington in the Black Hills region. (Thanks to the Case Library at Black Hills State University.